Another top brass of the military that hailed from Lawrence County is James V. G. Wilson who was born in Ellwood City, Lawrence County, Pennsylvania, on February 27, 1913, to Charles E. and Emma Vangorder Wilson. As a child he attended Hopewell, a one room schoolhouse. 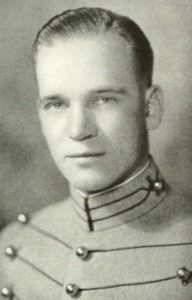 After graduating from Lincoln Highin 1930, he attended Geneva College for one year before entering the U. S. Military Academy at West Point. Wilson graduated from West Point in 1935, entering the Air Corps. Receiving his pilot training at the Advanced Flying School at Kelly Field, San Antonio, Texas, he was transferred to Scott Field, Illinois, in October 1936. (While in San Antonio he married Isabel May Steele and they would go on to have two children.) In November 1939, while stationed at Fort Benning, Georgia, Lt. Wilson was ordered to Mitchell Field, New York. Wilson became one of the first Army fliers of the autogyro, the forerunner to the helicopter. He was in the first class to train for the autogyro, and became an instructor for the second class. He also tested the aircraft for use with infantry troops. He was also a WWII fighter pilot. While flying a P-51 fighter in support of B-17 bombers on their way to Bremen, Germany on March 11, 1945, Lt. Col. Wilson’s engine lost coolant and his plane caught fire. His plane went into a steep spiral. Wilson was able to exit the plane and immediately parachuted. He landed near Rysum, Germany, where he was captured and held as a POW at Barth, Germany for the remainder of the war. 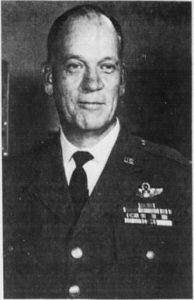 Retiring in 1965, he was promoted to Brigadier General. After retirement he served in various administrative positions at Colorado University retiring from there in 1978. He died at the age of 70 on August 7, 1983 and is buried at the Air Force Academy in Colorado Springs. James Van Gorder Wilson’s children and step-children include three sons James V. G. Wilson Jr., Lt. Col. Robert C. Badger, Dr. Robert M. Wilson and two daughters Barbara B. Barker and Mary W. Clark.